Kenneth Ellington asks Martha Berry if her sister, Mrs. Campbell, will be in Charleston in the winter of 1939. He also speaks of his recent trip to Savannah. 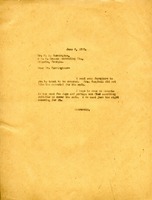 Berry writes to Hammond to say that she has received the list of guests and that her sister, Mrs. Campbell, wants all the guests to have tea with her. Berry expresses her excitement for the visit. 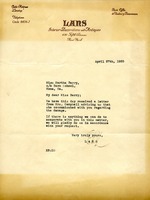 A letter from Lans Interior Decorations and Antiques to Martha Berry. The letter is confirming that they received a letter from Mrs. Campbell about damage. Letter to M. A. Harrington from Martha Berry concerning furniture that she sent to him by truck so he could cover it for her. She informs Mr. Harrington that Mrs. Campbell didn't like the material for the sofa and therefore she needs it recovered. She tells him that she will travel to Atlanta within the next few days to pick out something suitable for the covering. 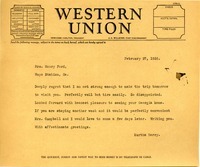 Martha Berry sends a telegram to Mrs. Ford saying that she cannot make the trip to see her because she tires too easily. She says she can't wait to see her Georgia home. She says that if Mrs. Ford is staying another week she and Mrs. Campbell could come in a few days.